If you have a steep hill to landscape certainly searching the internet you have seen many lists of plants that work well on a slope. But many you have not even heard of, many are not reliable in your region, or maybe you just can’t find something you like. It would be easier if you just knew WHY certain plants do well on a slope. I will try to give you an idea of what to look for when selecting plants for a hill so that you can go to your local garden center and select plants that thrive in your region. Don’t be afraid to add a few plants that are not necessarily suggested for slopes but that can add a lot of interest to your design. If you have created any terraces or contours you can plant just about anything on the flatter areas. Small ornamental trees, flowering shrubs, or upright and conical evergreens can add interesting height to the plant design and prevent the slope from looking like a drop off by breaking up the slope. Look carefully at the plant form. Most plants want to grow straight up no matter how you plant them, but can look distorted if planted at an angle for the slope and then grow upright. Anything ground hugging, even with a mounded form will simply grow along the surface of the slope, even if you plant them darn near sideways. Mugho Pine are a perfect example. Another form that works well is mounded but with cascading or weeping foliage. A weeping foliage allows you to plant at an angle with the foliage cascading straight down no matter the angle of the stem. Threadleaf Cypress are a good example. There are a few things that just make sense when selecting plants for a slope. Low Maintenance - it is difficult to maneuver on a hill so maintaining plants is not easy. Disease and Insect resistant - again, treating for problems or worse yet, replacing a diseased plant on a slope is difficult work. Drought Tolerant - even if you have contoured the hill water naturally runs down, often too quickly to absorb deep in the soil. Plants that are drought tolerant will manage with less water. Low Growing - Plants that hug the ground and spread like a mat are very good at protecting large areas of soil from erosion. Dense Foliage - A shrub with a lot of branches produces a dense cover of foliage to diffuse and divert heavy rain. Evergreen - or deciduous shrubs that leaf out early and hold their leaves late into the fall will protect the soil from erosion all or most of the year. Vining - vines grow very quickly and can add great interest to your slope. As the vines grow you can direct them as needed by using U shaped fabric pins to hold them in place. Vigorous roots - a spreading and vigorous system of roots will hold the soil best. Space your plants close together so that the hill is covered with foliage quickly. Water deeply and consistently the first year to encourage roots to establish deep and quickly. Create terraces or subtle contours and berms to slow down water runoff and encourage absorption into the soil. Add boulders to the hill to help contour flatter areas. Bury the boulders at least one third so they don’t slide down the hill. 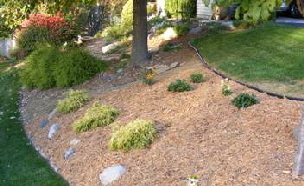 Apply a thick layer of mulch after planting to minimize surface runoff while the plants establish. Use heavy mulch that won’t blow or be carried down the hill in heavy rain. Large wood chips work well but so does shredded cypress mulch, which lays flat to resist movement. Refresh all open areas each spring. This list really could go on and on, there are hundreds and hundreds of plants that will do well on both gentle slopes and steep hills. But armed with the information above and a starter list to consider, you can make selections that please you and complement your landscape. Any perennial ground cover, there are so many to pick from. Foliage, flowering, for sun, for shade, for dry, for moist, you can find whatever you need. There are so many...creeping sedums, creeping thyme, creeping phlox, Wweet Woodruff, Irish Mossajuga,...the list goes on and on. Be aware that many can be considered invasive, but for your slope that could be a good thing. Most will behave fairly well if you give them enough room, and often any edging you use will stop them. But if they jump over, just trim them back with a grass clipper. Bishop’s Weed is one of those pretty aggressive ground covers, most of us know it as Snow on the Mountain. This groundcover is leafy and gets about a foot tall. It grows well in shade and part shade and is variegated green and white. Summer produces white flowers held above the foliage. Bishop’s Weed is invasive and will invade your lawn without a really good barrier, edging will not hold it. But if you can let it run, it is a dense groundcover, very heavy shade may slow down its spread a bit. Lamium, or Deadnettle is not as invasive as Bishop’s Weed and will do well in part sun or shade. Lamium can be controlled by cutting back to conain the spread. It has bright little leaves and much of the year produces tiny bright flowers. English Ivy is a lovely and fast growing vining ground cover that does an excellent job of erosion control. But it can be invasive, so watch for vines to cross your edging and cut them back immediately. Perennials of any variety can be added to your landscaped hill to add color and interest. It is best to place them where you can easily reach them, most will need at least a little maintenance. Daylilies are tough perennial plants that require no maintenance, are very tolerant of a variety of conditions and produce colorful blooms. The thick tuberous roots spread in a tough clump to hold soil well. Sumac ‘Grow Low’ is nothing like the sumac we think of growing wild along roadsides. But they are tough as nails like those sumac and quickly forms a mat of spreading foliage with open branches up to 8 feet wide if not more. Planted too close to less vigorous growers, ‘Grow Low’ will run right over them. The 2 foot tall foliage is a stunning orange red in fall. Super hardy, zones 2 to 10. Native Grasses are literally born to hold soil and thrive in their region. But be very careful, some can spread like wildfire. Many grasses will spread rapidly by underground rhizomes and by seed, soon taking over the your hill. That can be a good thing in some cases. Dwarf Forsythia ‘Gold Tide’ is a tough deciduous shrub.. Branches are produced in nearly wild tangles but that gently arch toward the ground once they reach a couple of feet long. The branches and foliage diffuse rain nicely. The dense branching will eventually form an arched mound that reaches the ground then spreading to a good 5 feet wide. Bright spring color is a bonus. Hardy in zones 5 to 8. Euonymus, or Burning Bush, is a great shrub for slopes. They produce extensive root systems, require little or no maintenance, will thrive in roadside conditions and produce fiery red foliage in fall. They can get 8 feet tall and wide or more, but can be pruned to maintain size. Euonymous fortunei, or Wintercreeper, is a vining evergreen that is excellent as a groundcover. It is drought tolerant and does well in shade. Cotoneaster horizontalis, or Rockspray cotoneaster, has long very dense branches that spread horizontally, excellent for protecting a slope. The branch tips will root, making this groundcover even better at holding the slope. Tiny leaves produce a dense foliage, and late spring brings tiny flowers. Red berries in fall persist into winter. And don’t forget to check on the groundcover evergreens, there are so very many choices with a variety of color, foliage texture and size.